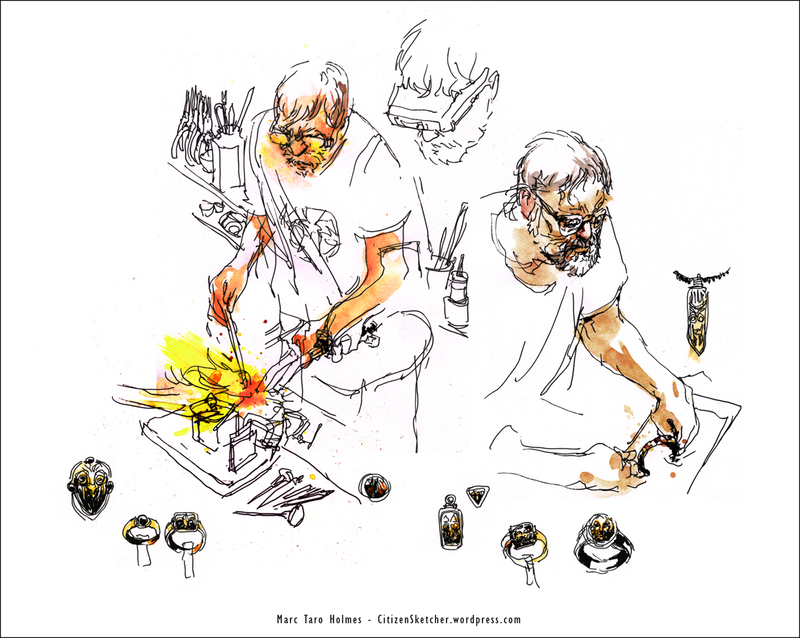 An esoteric craft such as goldsmithing is the kind of thing that leaves me inspired, and simultaneously doubting I’ll ever master something that….tangible. How can you not love an art form where you get to wield a flaming torch and hammer pure gold? It puts you into some kind of Lord of the Rings fantasy world. Talismans and magical rings emerging from the smoke and sparks of the forge. In this world of iphones it seems dedicated beyond belief. So, I was especially excited to visit the Montreal studio of goldsmiths and sculptors Lydia Ilarion and Marin Marino. The husband and wife team of artists live and work in a lovingly constructed space they call Ila Design. (http://www.iladesign.com/). Throughout the studio you’ll see furniture of their own design – handmade lamps, ceramics, and cabinetry. I was uniquely amazed to see Lydia’s bronze three-chambered crematory urn. Decorated with mythological creatures, it is designed to hold the two of them and their dog. I’ve always felt an artist should design their own funerary items, but I’ve never met one who actually did it. I’m getting off track – but this is a really incredible kind of sculpture. I mean, there’s some gravitas there! 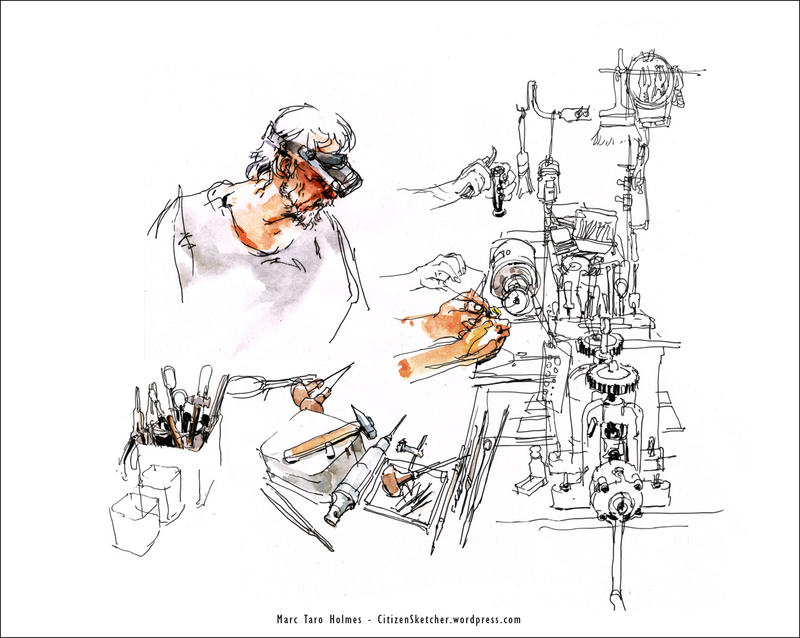 While we sketched Marin at work, he entertained us with stories of his background as a museum restoration artist in Sofia, Bulgaria. He has restored some outstanding examples of ancient Thracian gold and silver, and continues to create his current designs with the icons of that and other ancient cultures. It’s astonishing to me that humans made such things in 5 BCE – and then doubly amazing to meet someone who single-handedly reconstructed incredible artworks from scattered fragments. If you’re intrigued, you can find out more about Lydia and Marin at www.iladesign.com. 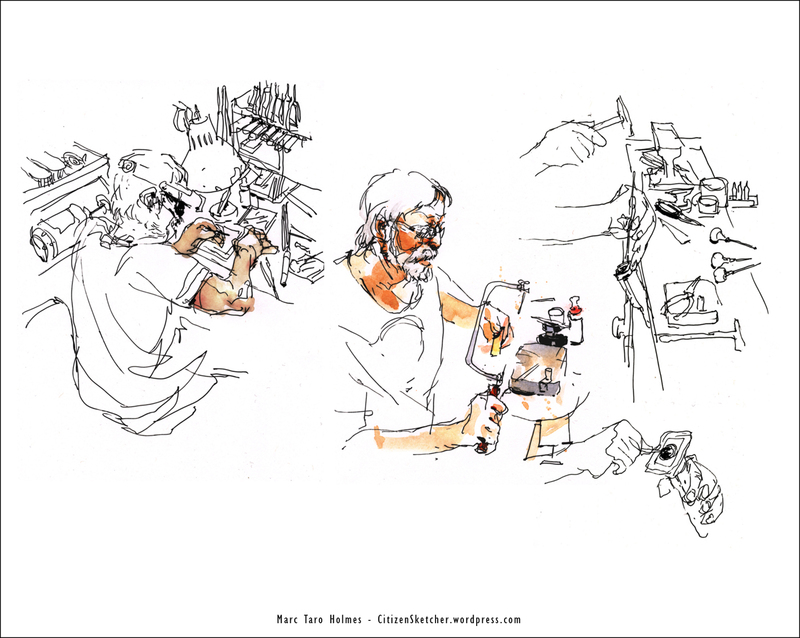 This was a unique opportunity to sketch a master craftsman in action. I can see doing an entire series on artists and craftspeople at work. If you know anyone who fits that description – and would possibly enjoy the experience of being sketched – please contact me! (Keep in mind, I’m based out of Montreal – but I would be willing to travel for the right thing). Ha! I tried to connect to you on Linked In and said although you were in Toronto, I still followed your blog. Well, at least the latter part is true. I DO follow your blog. I hope you are doing well.